Hindu Janjagruti Samiti organized Hindu Dharmajagruti Sabha on 19th April 2009 at D.G. Vaishnav College, Arumbakkam, Chennai. The Sabha received a good response with nearly 700 people attending the program. The program commenced with prayers and reciting of Vedamantra by Chidamabaram Dikshitars. This was followed by lighting of the lamp by Sri Sundaram, Retired IAS Officer. Later the dignitaries on the dais were felicitated. Sou Srividya Bharadwaj and Sri Shanmugan did the compeering. Sri Prabhakaran, Coordinator of Hindu Janjagruti Samiti, Chennai gave a brief introduction about Hindu Janjagruti Samiti and its activities. Sou. Sugandi Jaikumar spoke about Sanatan Prabhat and its unique features and role in Dharmajagruti. Sou. Sailaja Vittaldev from Sanatan Sanstha spoke about Sadhana, including individual and collective spiritual practice. Sri Sundaram, Retired IAS Officer spoke about the harms of pseudo-secularism and the mistakes committed by Nehru Gandhi family in declaring our state to be secular. He observed that during independence Hindus were in majority, 82 %, but now it is not so. He mentioned that we have to remember Swami Vivekananda’s words in which he said that our Nation’s strength is Hindu Dharma. Sri Sundaram quoted famous verses of Mahakavi Bharati describing the glory of our nation and people. He also recited various verses to describe the present pitiable state. Sou. Uma Ravi, CO-cordinator, Hindu Janjagruti Samiti spoke about the current pitiable situation of our nation and Dharma. She spoke about the conversion activites, the denigration of deities and lack of Dharmasikshan and dharma acharan among Hindus. 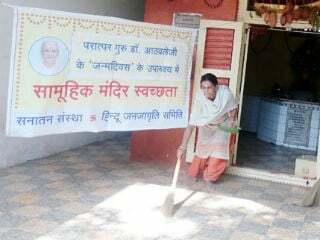 She highlighted the need for Dharmajagruti among Hindus. Later, Maharaj Anand Chaitnaya Swamiji spoke about Dharma and how Karma is inseparable from our culture. He said that we ourselves don’t know who we are, we are enticed by many things. He emphasized that a child should feel proud that he or she is a Hindu. He also mentioned that rather than getting influenced, we should not influence others. He said that our culture is not aggressive and remarked that what we are supposed to do, Kanchi Acharya Swamiji is doing. He clarified that if we ourselves do not understand, we cannot suggest to others. He emphasized that the time has come to unite and we should encourage each other. The last speech of the program was given by Sri Kanchi Kamakoti Peetham Jagadguru Sri Jayendra Saraswati Shankaracharya Swamiji. Swamiji recalled how He had come into contact with Sanatan Sanstha when he visited the Ashram at Goa and had met His Holiness Dr. Jayant Balaji Athavale. Swamiji explained how our Dharma is Sanatan, there is no birth or death. While we can keep worldly things in lockers for safekeeping, Dharma has to be practiced in day to day life. When we do that our life will be filled with divine effulgence. Dharma has no deterioration because of the lack of dharmacharan by Hindus, it appears so. Mentioning that He got a Rama photo, Swamiji elaborated about Rama Vigrahan Dharma and how Rama is a personification of Dharma. He mentioned that now many people consider donation to schools, colleges, hospitals etc as Dharma, but this is not so. Dharma means to follow the culture and tradition. 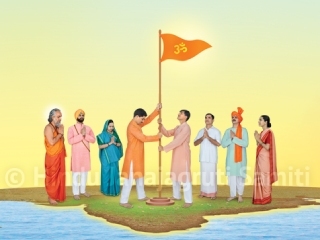 He also stressed that we have to concentrate on Dharma rakshan and our Dharmik path is like a single way path well trodden by our saints, and is not created by the efforts of a single person. He emphasized that this path is safe and sure to take us to our destination and there are no hazards, whereas other routes are like highways with signals, traffic hazards and accidents. Swamiji suggested that for our children to follow dharma we have to set an example. He lamented about the tremendous western influence among the younger generation. Swamiji remarked that while there is a lot of faith intact among village illiterate people, it is absent among the well educated city bred people. He strongly emphasized that All are equal, be it Brahmins or others and this is well established by Alwars and Nayanmars. He explained that due to this equality we call everybody as our brothers and sisters, whereas in other religions they are addressed as sinners. Swamiji emphasized that it is imperative to destroy the negative energies. Further, He said that the Samiti’s effort is just the beginning and this Samiti will bring all Hindus irrespective of their sects and differences for Dharma rakshan. He mentioned that at present asuri shakti is more and there is a need to imbibe in ourselves dharma anushtan, bhakti, faith on Lord. 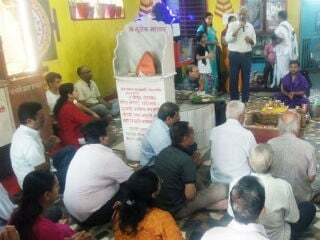 He urged everyone to unite through this Samiti and emphasized that it is important to not only unite but also practice Hindu Dharma in a collective way. He remarked that this is just the beginning; day to day by this should grow by leaps and bounds. The program concluded with passing of resolutions, vote of thanks and singing of Vande Mataram. Sri Sankara TV channel covered the entire program. Doordarshan Channel also covered the program and telecasted in news. The English monthly Sanatan Prabhat was well received and 18 people have subscribed to it.